Common misconception: Basements so dark and drab. Paint them a bold color. The biggest mistake people make is painting their basements bright bold colors thinking it will make them brighter. Actually, correct lighting will make a dark room brighter. Track lighting used here is a great choice for a basement. Todays fixtures are not giant white cans like in the 70’s. For paint colors stick to colors that are soft and light. Too bright and they’ll advance at you and feel shocking and jarring. Another tip for a basement? Use flooring suitable for a basement (below grade.) 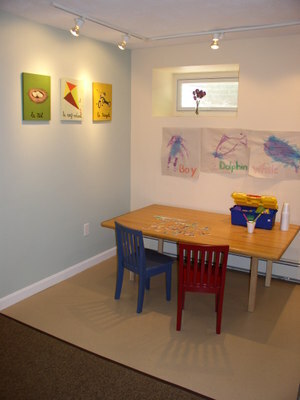 Vinyl composite tile (VCT) used here is a great choice for the art area. Were this basement to ever flood, it’s easy to take up.